Recently, we took a journey to the Columbia City Bakery. Though we'd tried their pastries at some of the various coffee shops which they supply in the Seattle area, we wanted to see the source. Now, anyone who has ever taken the bus from Queen Anne to Columbia City will understand that not just any pastry would be worth the trip. But what made it all worthwhile was our newest obsession: the Doughnut Muffin. 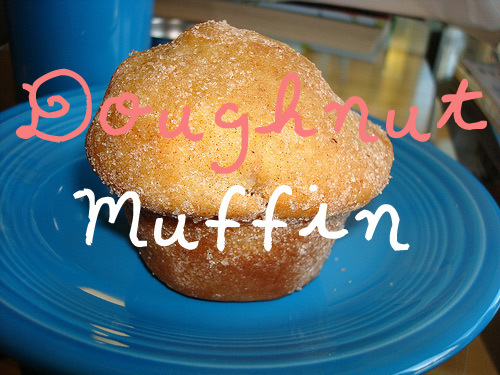 What is a doughnut muffin exactly? In terms of appearance, it looks more like a muffin than a doughnut, but without a cup. But instead of the slightly craggy muffin-top, this one was smooth and more cake-like, and coated with a cinnamon-sugar coating that did kind of resemble that of an old-fashioned doughnut. Its surface had a slight sheen, which made us wonder if it was fried (it's not; it's coated with a layer of butter which gives it that dewy, just-kissed-by-a-fryer look). The texture is not unlike a cake doughnut, but with a denseness that speaks more to the muffin side of things. But most importantly, what does a doughnut muffin taste like? Well. Upon first bite, Mr. Cakespy's first words were "it tastes like a muffin...and a doughnut...all at once!". To us, this is a beautiful fusion: for one beautiful moment, as the buttery coating, crunchy cinnamon-sugar topping and cakey inside melt together in your mouth, everything else disappears. Doughnut Muffins can be found at the Columbia City Bakery (call ahead for availability), 4865 Rainier Avenue South, Seattle; (206) 723-6023. Happily, non-Seattleites need not despair! We located a wonderful variation on the doughnut muffin recipe (inspired in part by the above ones!) on one of our favorite Seattle foodie blogs, Orangette. Click here to see the post and recipe!